For abscesses or engorgement of the breast, Raynaud’s, infected wounds and sores, rheumatism, sprains, bruises, osteoarthritis, sore throat. 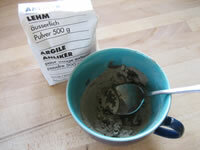 – Crushed clay (in a nutrition store or pharmacy, less expensive than fine clay). – Cover the infected part with a large clay poultice (directly on the skin). Cover it with a clean, ironed cloth (to remove the microbes! 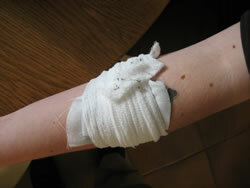 ), then a bandage to keep it in place (or with a bra in case of a breast abscess). Leave it in place for a maximum of 2 hours or even less if the clay becomes dry before that. Repeat as often as possible; continue even some day days after healing. Do not use the same clay several times: throw it out after use! Do not use it on stitches! “To be used even in the case of a real breast abscess, with flow of pus and high fever. When breastfeeding my second child, I applied poultices at the onset of an engorgement and thereby avoided it turning into an abscess… The gynecologist was surprised at the result! “.